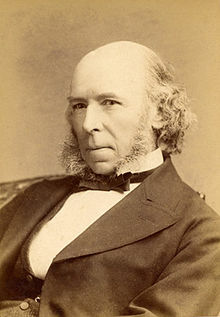 Herbert Spencer was one of the most important and influential intellectuals of his day, yet little more than 30 years after his death, Talcott Parsons could ask, “Who now reads Spencer?” One could cite many plausible reasons for the precipitate decline in interest. I suspect his thought was too politically loaded at a time of great intellectual ferment in the realm of political ideology. As a result, he attracted many enemies among those who considered his work incompatible with their own pet theories. Perhaps the most damaging accusation was that Spencer was a social Darwinist. The grounds for this charge were flimsy at best, but since Spencer was no longer around to defend himself, it stuck. There is an interesting discussion of the matter on his Wiki page. Spencer was not infallible. For example, though he was a strong evolutionist, he favored a Lamarckian version of the theory over Darwin’s natural selection. However, our species is not noted for its infallibility, and the fact that Spencer made mistakes is more a reflection of the broad range of his thought than of the caliber of his intellect. People who never speculate never make mistakes. Spencer did speculate, and some of his thought was profound indeed. Robert Ardrey, never one to be unduly influenced by the opinions of others, noticed, pointing out that Spencer coined the terms “code of Amity” and “code of Enmity,” referring to what are now popularly known as in-groups and out-groups, nearly a century before the academic and professional experts in human behavior caught up with him. There was another subject regarding which, in retrospect, he was a true prophet; his analysis of revolutionary socialism, which later became known as Communism, presented in his introduction to a collection of essays entitled A Plea for Liberty. Milovan Djilas also knew something about Communism, having been a Communist for a significant part of his adult life, and an influential one at that. From 1945 until 1953, he was one of the four most powerful men in Tito’s Communist regime in Yugoslavia. However, Djilas had a strong sense of intellectual honesty, a great drawback for a Communist ruler. It inspired him to write a series of critical articles in the Yugoslav Party organ, Borba, followed in 1957 by publication of his great classic, The New Class, an indictment of Communism still strongly marked by the author’s tendency to think in terms of the Marxian dialectic. His final work, The Fall of the New Class, published in English three years after Djilas’ death, and written after the collapse of Communism in the Soviet Union and eastern Europe, may be considered his post mortem on his old ideal. In comparing Spencer’s predictions with Djilas’ documentation of what actually happened, one begins to understand why the former’s contemporaries were so impressed with him. Iron and brass are simpler things than flesh and blood, and dead wood than living nerve; and a machine constructed of the one works in more definite ways than an organism constructed of the other, – especially when the machine is worked by the inorganic forces of steam or water, while the organism is worked by the forces of living nerve-centers. Manifestly then, the ways in which the machine will work are much more readily calculable than the ways in which the organism will work. Yet in how few cases does the inventer foresee rightly the actions of his new apparatus! Read the patent-list, and it will be found that not more than one device in fifty turns out to be of any service. Plausible as his scheme seemed to the inventor, one or other hitch prevents the intended operation, and brings out a widely different result from that which he wished. What, then, shall we say of these schemes which have to do not with dead matters and forces, but with complex living organisms working in ways less readily foreseen, and which involve the cooperation of multitudes of such organisms? Even the units out of which this re-arranged body politic is to be formed are often incomprehensible. Everyone is from time to time surprised by others’ behavior, and even by the deeds of relatives who are best known to him. Seeing, then, how uncertainly one can foresee the actions of an individual, how can he with any certainty foresee the operation of a social structure? But communism took a vow, so to speak, that all its prophecies, all its ideals, would turn into their diametric opposites just when Communists thought these prophecies and ideals might actually come true. So it was that with the coming of Communists to power the working class and communism drew apart from one another, became alien. It did not happen uniformly, and it took various forms. By and large, this coincided with the metamorphosis of the Party bureaucracy into a privileged, monopolistic stratum of society. A special elite – the new class. The transformation of the Party apparatus into a privileged monopoly (new class, nomenklatura) existed in embryonic form in Lenin’s prerevolutionary book Professional Revolutionaries, and in his time was already well under way. It is just this which has been the major reason for the decay of communism. Thus he, Stalin, the greatest Communist – for so everyone thought him save the dogmatic purists and naive “quintessentialists” – the incarnation of the real essence, the real possibilities, of the ideal – this greatest of all Communists, killed off more Communists than did all the opponents of Communism taken together, worldwide… Ideology exterminates its true believers.